So, I wasn't planning on writing a blog post about this since I had already posted about making yummy steaks (Juicy Steaks at half the cost of a restaurant meal), but Jon wanted to take pictures of me cooking the steaks. 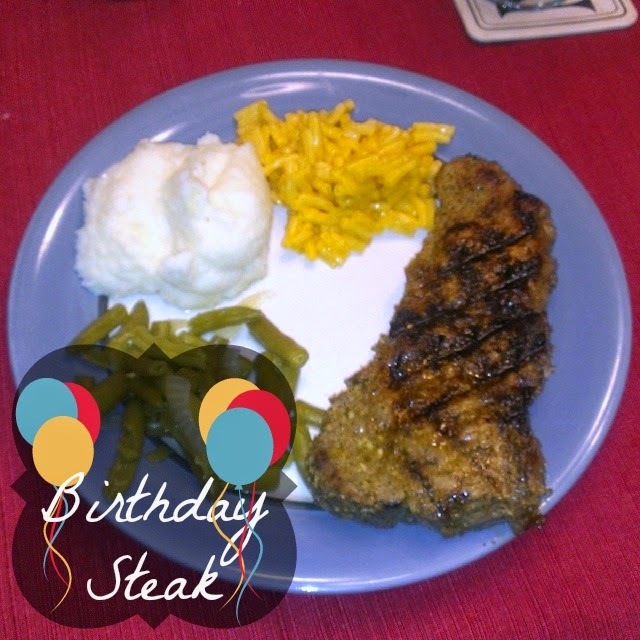 Yes, you read that right - I cooked my own birthday dinner. Normally we go out for my birthday, but we had already gone to Texas Roadhouse for Easter the week before. I decided that since Jon's been coming home later than normal that it would just be better for me to cook my birthday dinner. Plus the plate you see above is my plate - Jon would only eat the steak and mac-n-cheese (which I made for Michael). When we went grocery shopping at Wegmans on Sunday, we picked up a two pack of Strip Steak First Cut (not exactly sure what that means, but it was all we had to choose from in our price range) for $15.19 (roughly $7.60 per steak). You may think that's a little to much, but that is for two extremely think pieces of steak. Plus if I had gone to Texas Roadhouse, I could easily spend with my drink included that much on my meal alone! Monday afternoon I prepared the steaks with a McCormick Grill Mates marinade called Backyard Brew. It said on the packet that instead of water you could use beer, I wonder how much that would of changed the flavor? Once I had the marinade mixed, I took a fork to the steaks and poked holes so that the marinade would soak into the meat. Switch the milk and water. The amount that the instructions says for water, use it for the milk and vice versa. I use that little trick every time I make my instant mashed potatoes. Makes them super creamy! Time to grill these super large steaks! It rained all day Tuesday so, even if I wanted to grill them on the charcoal grill that was not an option. I had a hard time at first to get both steaks to fit and make sure that all the steak was being cooked. No room for anything else on there! I like to brush the marinade on both sides of the steak when I first put them on the grill and every time I flip them. I'm not sure how long I cook them. Every few minutes I would flip and brush more marinade on. When I felt they were good, I cut through the center of each to make sure they were cooked the way we like them. Then put them on a plate to rest. Finish up with the rest of the sides and then it's time to come and get it! What do you all normally do for your birthdays?